• 384 well format microplate reader with standard fluorescein isothiocyanate (FITC) excitation and emission filters. PerkinElmer Victor microplate readers are a suitable choice. 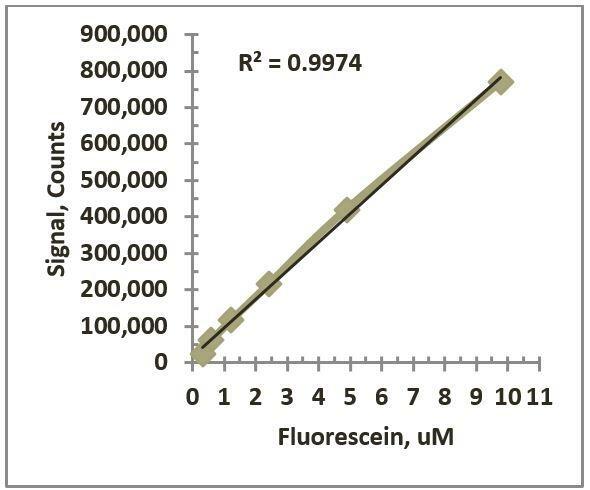 (i) Determine the linear signal range for fluorescein in your microplate reader. From the standard curve shown in Figure 1, we have determined that 1 µL of a 5 uM fluorescein solution in CV buffer results in a signal of ~ 400,000 counts which is approximately the mid-point of the linear range for fluorescein (100,000 to 600,000 counts). (ii) After determining the optimal fluorescein concentration (after dilution in CV buffer), make enough to fill a standard automation reservoir. For example, 100 mL is enough to fill an upside down tip box lid which a popular option. (iii) Fill each well of a 384 well white microplate with 60 µL of CV buffer. Note: black microplates can also be used but the standard curve would need to be repeated in these microplates. (iv) Using Fluotics Agilent Bravo compatible automation pipette tips, a VWorks liquid handling protocol was created to transfer 1 µL of fluorescein from the reservoir to each well of the 384 well microplate previously filled with 60 µL of CV buffer from step iii. The VWorks liquid library was iteratively modified to optimize the accuracy and precision of the 1 µL transfer. (v) Centrifuge the plate for 60s at 1000 x g.
(vi) Read the microplate using standard fluorescein excitation and emission filters. (vii) Determine the % coefficient of variation across the 384 well microplate by dividing the standard deviation by the average signal of the entire microplate. Figure 1. Example fluorescein standard curve showing average signal counts across the linear range (n = 16). Fluorescein was dissolved in 100% DMSO to 10 mM then manually serially diluted in a 384 well plate row-wise with a 16 channel pipettor. 1 µL from each well of the serially diluted plate was transferred (using an Agilent Bravo with 384ST head) to a 384 well white microplate (Greiner catalog no. 781207) containing 60 µL of CV buffer. The microplate was then centrifuged for 60s at 1000 x g and read in a PerkinElmer Victor3 microplate reader using a standard FITC filter set at 0.1s per well photomultiplier count time. Fluorometric dyes provide a simple, fast, and inexpensive method for assessing instrument and/or robotic pipet tip performance. 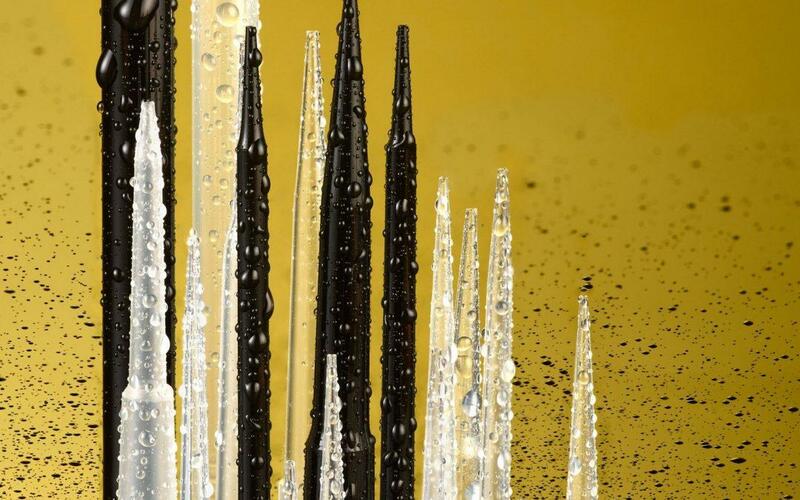 The performance of each lot of pipet tips manufactured by Fluotics is tested for precision and accuracy, in addition to other “real world” tests. These data are provided to our customers when requested.